Thursday morning we were up uber early to watch the USA v Russia Rugby World cup game. 4am, thank you very much. Rugby is not really my thing. Now, I’ll watch a game and a day at Twickenham is always fun times. Waking up at 4am to watch a game would never be my idea. But, when the hubby is up and watching the game, I don’t know, I can’t sleep, I feel like I want to get up and be part of the fun. (Yes, I know I’m crazy). Once up, watching the game is, err, a little boring. And I thought my time would be better spent baking. 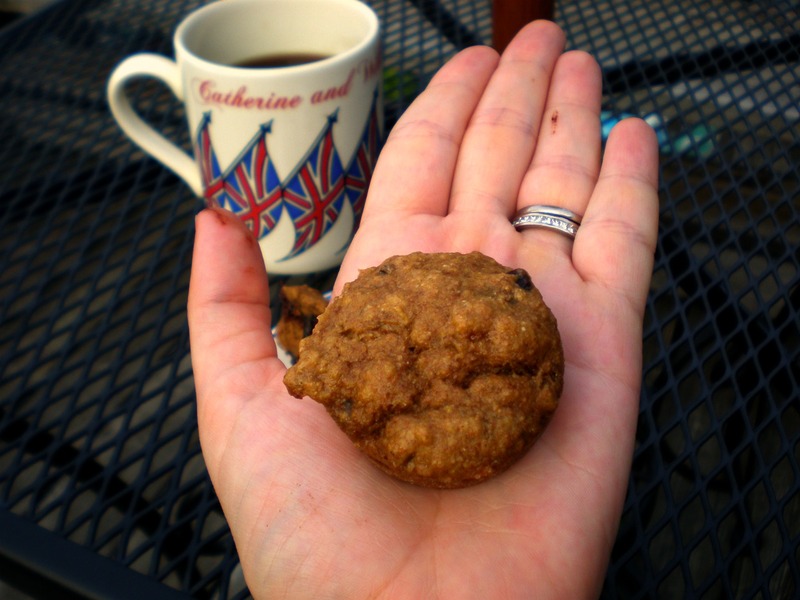 So, I give to you Pumpkin Banana Chocolate Chip (mini) muffins. That’s a lot of name for a mini muffin. (Oh, and please ignore the melted chocolate on my hand. Couldn’t be helped). 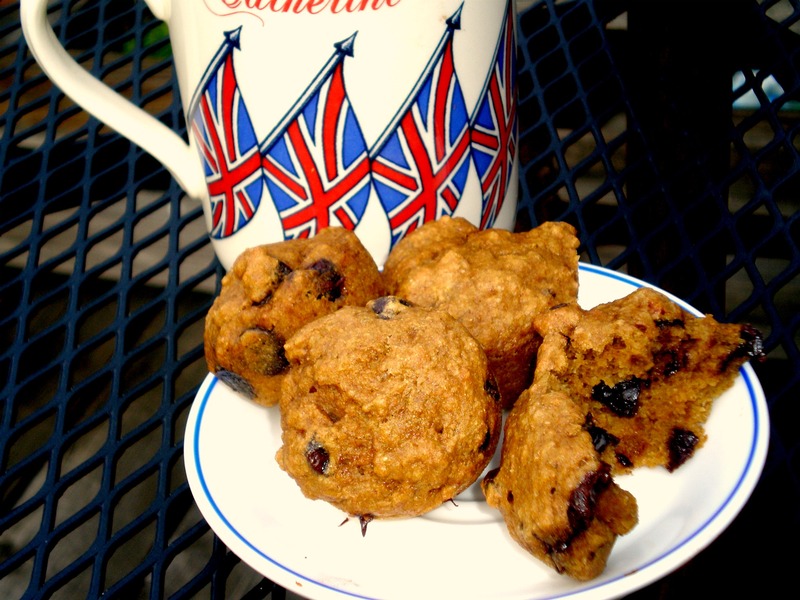 Lots of wholesome goodness in there and I could have easily called these “Pumpkin Banana Applesauce Chia Chocolate Chip Muffins”. But, that sounds a bit pretentious. 🙂 Lovely, easy and a taste of fall that you can feel good about eating. Enjoy! Preheat oven to 375. Grease muffin pan. In one small bowl add chia seeds and 3T water and let soak, in another small bowl add egg replacer and let soak. 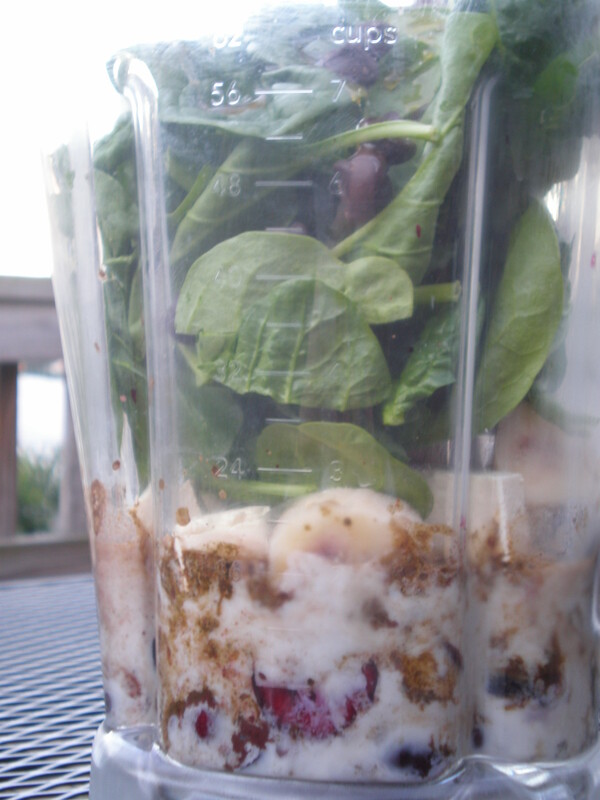 Mix together wet ingredients (banana through egg replacer). Save the soaked chia and egg replacer for last to give them more time to soak. Add the chocolate chips to the batter. Fill muffin cups 3/4 full. Bake for 16-ish minutes until a knife or toothpick stuck in the center comes out clean. Cool & enjoy with coffee! Oh, and the USA won. USA! Warning. I am going to eat A LOT today. 9 mile run this morning and bikram yoga this evening, I know I need to fuel up. This is one of my favorite ways to get a good start in the morning. Gooey, banana-y, peanut butter-y, warm, crunchy, messy. Delicious. 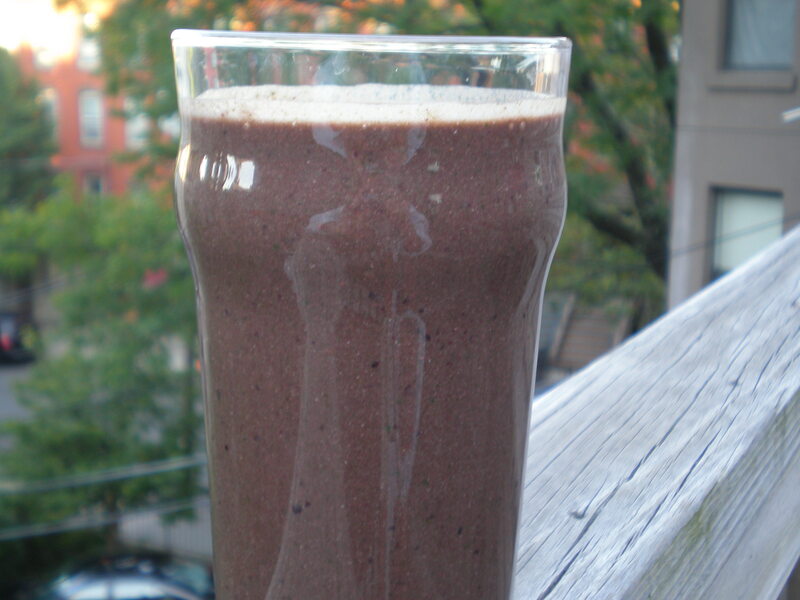 In a small bowl, mix together the Chia seeds, oats, milk, vanilla extract, cinnamon and mash the banana. Once the mixture is combined flip into a nonstick skillet and cook on that side for 3 minutes. While scramble is cooking, toast the English Muffin. After the 3 minutes, flip the scramble to the other side. This may be a little messy. And cook 3 minutes on the other side. 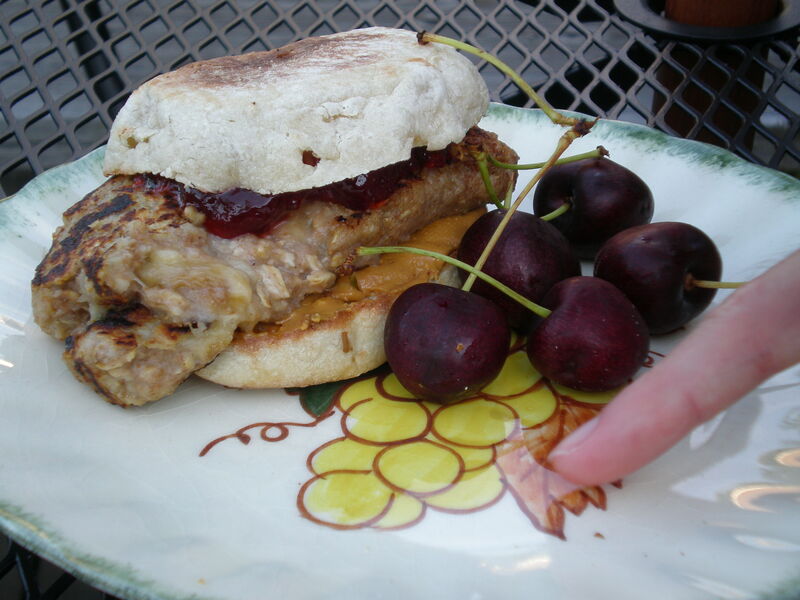 Top one 1/2 of the English Muffin with peanut butter and the other 1/2 with jam and then add the Banana scramble. Mmmmm. Good morning to you!! I woke up this morning “NEEDING” some fruit and vegetables. ASAP. A Green Monster was calling my name. It may have had something to do with eating an entire loaf of focaccia last night in lieu of dinner. That wasn’t my intention, I just stopped by a local market to pick up the loaf on the way home, and before I knew it; GONE. But, delicious. I blame it on the 12 mile run + 4 mile hike I had done the day before. My body apparently still needed to replenish some carbs. 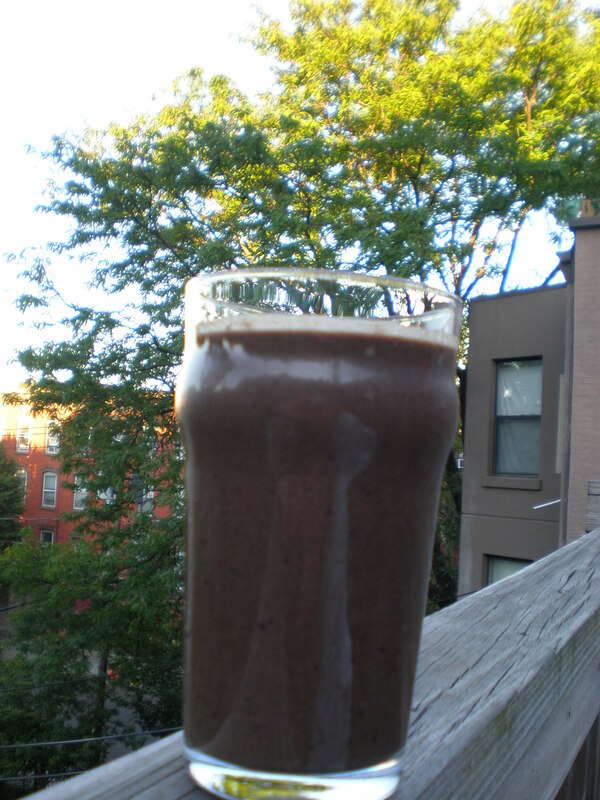 3 – Pour into a glass and drink your veggies!